← Did You Get Your Bonus Entries? 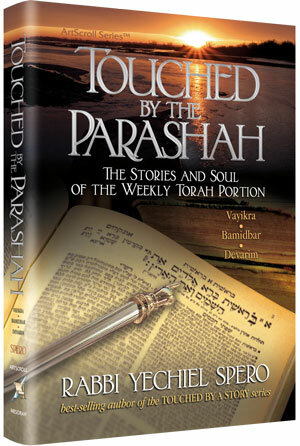 If you’re one of the tens of thousands of people all over the world who has been touched by one of Rabbi Yechiel Spero’s stories, you don’t want to miss this week’s download from his best-selling volume on the weekly Torah portion: Touched By The Parasaha 2: Vayikra, Bamidbar and Devarim. Master teacher and story-teller Rabbi Yechiel Spero has a gift for telling stories. In this best-selling series on the Parasha, Rabbi Spero imparts his insights and stories and drives home the lessons of the weekly Torah portion in an enjoyable and inspirational form. Click here for all titles by Rabbi Yechiel Spero. ***Time is running out on our big Talmud Set Giveaway! Did you enter yet? Click here to enter the raffle for a free Shas!